Stop importing and exporting data - it's reducing your productivity! Since Ray Tomlinson created the email back in the ‘70s (1972 to be precise), dozens of other online communication tools have followed suit - many of which are used by universities to communicate with their students throughout the learning lifecycle today. But often, using several systems simultaneously can complicate matters and prove time-consuming. Online communication has had a transformational impact on the relationships students have with both their tutors and admissions advisers, and has altered the way in which they engage with institutions as a whole. Access to the internet and email has gone some way to help level out the playing field and made the prospect of higher education seem more accessible to those who may not have initially considered it as a viable option. The many systems available help admissions and marketing specialists to target students and promote their university in a bid to attract students from all walk of life, however this is no mean feat and it can be incredibly time consuming, not to mention something of a burden on resources. This is especially relevant to universities who use several tools, instead of a single multi-functional system like an admissions and CRM solution for higher ed. "FULL FABRIC is easy to use and has streamlined our communications, making our day-to-day easier and our appearance to prospective students more structured and organised." For those without a CRM, or even without one that integrates properly with other systems, the simple task of sending an email, say, to everyone on the MBA who are taking the Asset Management elective can take hours - and a lot of forward planning. It’s likely that they will have to export data from a programme like Excel into their Student Information System (SIS), and then export and upload it to an email application such as Mailchimp or GetResponse. Once signed, sealed and delivered, the user will then have to transfer any responses to the SIS again. Instead, time could be spent much more productively on crafting great content or even A/B testing different methods to increase student engagement. Start using an integrated admissions and CRM solution! The answer to administrative chaos is simple: ditch the disparate systems and invest in a solution that will manage everything from one hub. With a CRM in place, there’s no need for other systems as its scope and functionality enables the user to perform a multitude of tasks from one fundamental place. FULL FABRIC is a prime example of a CRM that ‘does it all’. "FULL FABRIC greatly reduces the need for disparate tools. It brings almost everything together in one easy-to-use platform which has a positive impact on productivity and student satisfaction." So what is it capable of? A good CRM for higher education will integrate with whatever systems the university already has in place. A CRM is intelligent in the sense that it is capable of recognising and working in conjunction with, for instance, the in-house Student Information System. This means that adopting this technology can be a lot quicker than one might expect. These systems are comprised of several components and can perform a multitude of tasks in an automated, dynamic way. 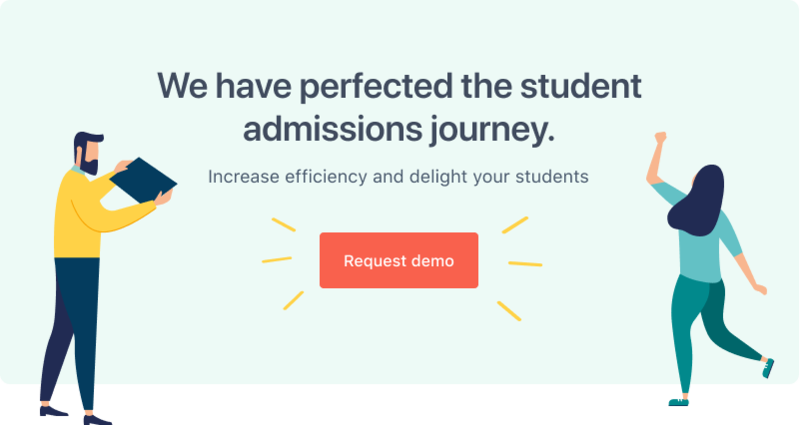 They are designed with the user in mind, but perhaps most importantly, they benefit the student by helping to create a more transparent, streamlined and informed admissions and student journey. One of the great things about a CRM is that it connects everyone’s interactions with an individual student or cohort and makes it easy to share information, capture notes, assign tasks, receive notifications and collaborate productively on projects to maximise an individual’s success, wherever they are at in the student lifecycle. And whilst the humble spreadsheet can highlight when a user first enquired about a course at a university and other interactions thereafter, it can’t do a lot else. On the other hand, a CRM will present the user with a chronological timeline of all interactions with details of their method of communication (e.g. email), as well as vital information on how users engage with specific landing pages, events and application forms. Do you think your university could benefit from a bit of CRM technology? Feel free to get in touch to find out more about our all-in-one solution.